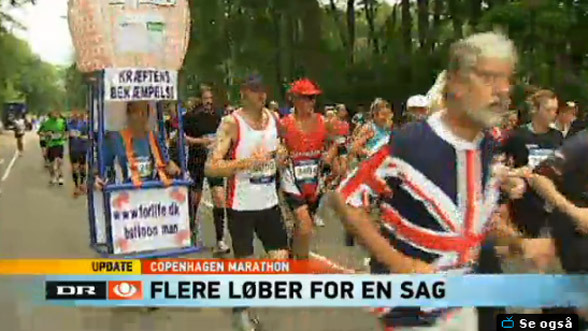 Yesterday was the day of the Copenhagen Marathon 2011. 12,000 people had shown up to run the 42 kilometers, with many thousands of spectators and supporters along the route. Organizations are increasingly using big events like a marathon to help promote a cause, and yesterday was no different. Except that it was. 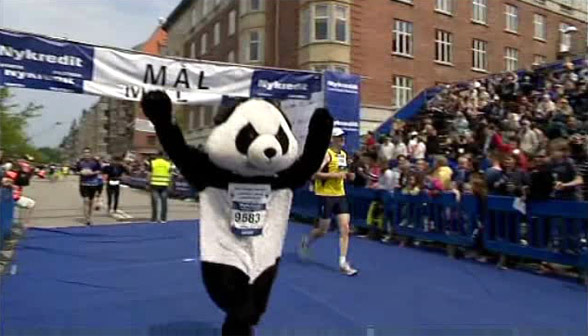 The online manager of the WWF Denmark, Jonas Juhler Hansen, decided to run the marathon... in a panda bear costume. Here is a picture from when he crossed the finish line. Note: Photo via TV2 News. Just think about this for a moment. 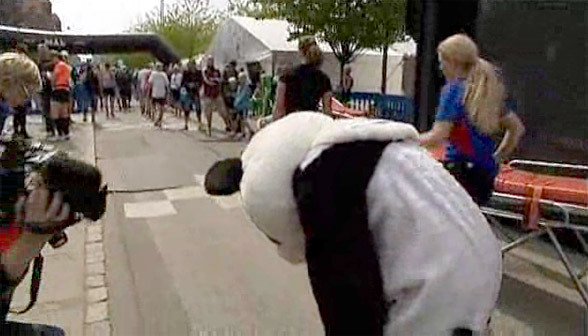 You are standing on sideline, watching 12,000 people run by, and suddenly you see a PANDA!!! Who do you think people are going to remember? The 12,000 runners or the Panda? The reason he did was because of three things. It was to help create awareness about the WWF. It was to raise money. But mainly, it was just for fun. As a campaign, it was absolutely brilliant. And because we now live in this ultra-connected social world, the twitter channels were buzzing about him. He was also featured on all the major newspapers and TV stations. People in social media (like me) are often entirely too focused on social interactions by following a link or clicking a like button. But this is how you really get out to "where people are." 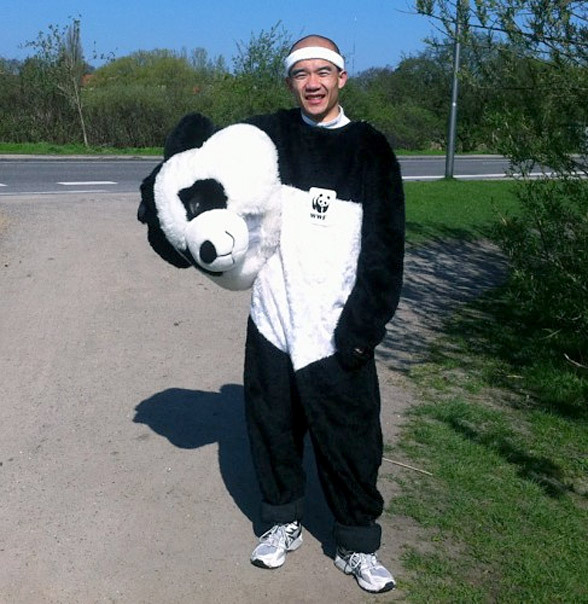 The social effect, after seeing a Panda run a marathon, is a lot higher than any like button on a website. It was not a social strategy. A strategy involves a long-term focus on getting people to share continually. This was a campaign. A great thing to do, but you cannot do it every day. Another factor, which is even more important, is authenticity. Jonas didn't do this because it was something they had cooked up in a marketing meeting. He did this because he truly believed it would be fun. This wasn't a branded costume with a big logo down the side. This is a guy with a passion and a crazy idea. A number of other people also decided to "cash-in" on the event, like this guy, who decided to run around with a big banner ad. Sure, he might also believe in the cause he is trying to promote. But, running around with a huge banner is just marketing. People do not care about ads. While this box guy did attract some attention, it didn't feel authentic. Do it for real, do not be a banner. Jonas is worth admiring. I certainly do. Follow him on twitter, visit his blog, or head over to pandarun.dk.